M’s got the whole week off school because of Regents exams, which she’s not taking. As the week approached, the list of things to do has kept growing: getting paperwork and arrangements in order for the field trip to Spain in April, do some SAT prep, think about what to do over the summer, come up with a college list. . . . and yet, all of these important items on the to-do list were suddenly outranked by a sudden, pressing concern: the prom dress. At M’s school, almost everyone goes to the junior prom their junior year, whether with a date or a group of friends, and so while last year we hustled to buy a dress when she got an unexpected invitation shortly before the event, this year it’s been simmering on the back burner since, well, approximately forever. Part of the process is that the entire junior class of girls and any other dress-wearers who plan to attend the event join a group to share photos of their dresses so that there aren’t any duplicates. Yes, various stores try to track these things, but with online shopping and swapping dresses, establishing your particular dress territory in the group is the way it goes. And starting a couple of weeks ago, flags started getting planted. As you might expect, when those first dresses get posted to the group, it accelerates the process, because what if someone ends up claiming The Dress That You Were Meant To Have? And even if you are relatively chill about the whole thing, as M is, when you get a notification every time someone else has claimed a dress, it can get stressful. So we spent Tuesday afternoon dress shopping. We had a tight schedule, because we couldn’t leave before noon, but then M had track practice at 3:15 pm, followed by a visit to the town hall for a meeting in which the track girls got told that they were awesome at 7 pm, followed by a soccer practice after that. So we had a three hour window which luckily turned out to be plenty of time. Last year we bought M a lovely dress at the last minute at Fancy Schmancy in Latham. 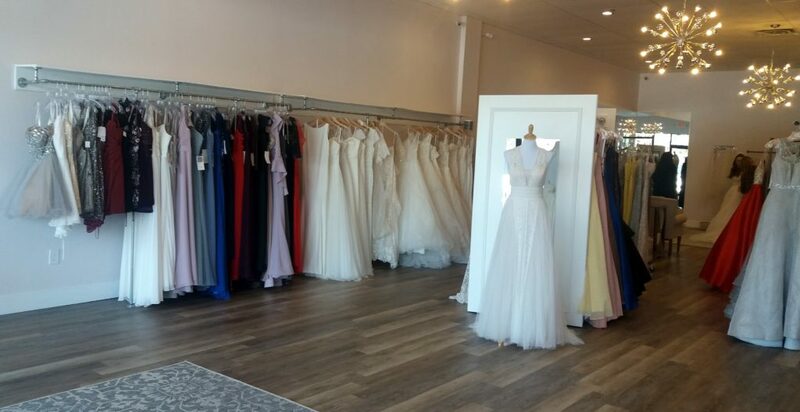 It’s a nice store with a wide variety of dresses in a bunch of sizes ranging from a little expensive to super-expensive, plus all sorts of excellent accessories. If you’re in need of a super-fancy dress, I’d recommend it, and it was excellent for us last year because we were able to buy a dress off the rack and take it home with zero alterations, so that was awesome. (In case you don’t remember, there’s a photo of her trying the dress on in the store here). This year, M wanted to try a new boutique called Azalea. Azalea is on Carmen Road, in that weird area that’s mailing address Schenectady, but feels like it might be either Guilderland or Rotterdam, do you know what I mean? M had noticed that all of her favorite dresses from the group chat’s photos were at Azalea, so she wanted to make it her first stop this year. Azalea is a relatively new shop and the owner is super-nice and helpful. Incidentally, they’re having a prom dress fashion show for the Leukemia & Lymphoma Society this Sunday. Azalea just has a mid-sized sample of each dress for you to try on, and if you’re a lucky size 2 like M, someone flutters around clipping the extra fabric to show you how the dress would fit if you ordered it in your size. Or pulls out the catalog so you can see the other colors available for that style. 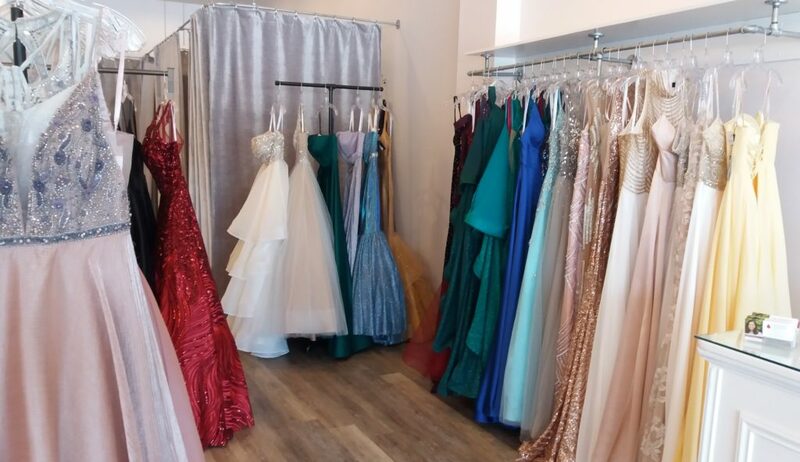 So this is not your place for a last-minute selection, but there are basically no bad dresses in the mix. Even after a busy Saturday, everything looked pretty pristine, helped along by the fact that we all removed our shoes and exchanged them for fuzzy slippers to keep the winter muck out. And they’re super-attentive. If I ever looked this hot in a dress I would purchase four of them and wear the same dress everywhere I went. You’d see me gliding by with my shopping cart in this thing. Now that I’ve seen what’s available, my fashion predictions for this year are that you’re likely to see a ton of super-strappy backs and plenty of plunging necklines. There are still a few of the blue-and-white patterns that were popular last year, but there seems to be quite a bit of peach-toned dresses out there. She ended up finding a dress that she liked enough for us to go ahead and pull the trigger on, and much to my delight, it was the least expensive dress that she tried on. How awesome is that? Last year M looked like a princess, and this year’s is a little more va-va-va-voom. You’ll see it eventually, but not yet. Actually, if you want to play Where’s Waldo, it does appear in one of these photos, but in May I’ll share a photo of her wearing it. Can’t wait to see the photo! On another note, can you tell me more about this Regents thing? Are parents able to opt their students out of it? Umm, for the Regents week, I think it’s because some kids take year-and-a-half long integrated Regents courses, and then this is their final. I have no idea what the options are for it. It doesn’t seem like very many of the kids are taking the exams, but it’s just like you might take a Regents exam as your final at the end of the year. Oh, okay. My son is still in elementary school,but I’m always on the look-out for tests that we can opt out of. I guess we’ll figure it out when the time comes. Yep, I spent years skipping the kids out on tests and now poor M’s doing test prep in her spare time!